Addison Cavanaugh had one rule: Do not date hockey players. So kissing the newest trade to her dad's team should have been off-limits--even if he is hot enough to melt the ice. After being traded in the middle of the season, Bane Bannister wasn’t looking for trouble. In fact, he’d been instructed by his new coach to stay out of trouble and away from women. Too bad the only woman he’s interested in happens to be the coach’s daughter. Is the hunky hockey player enough to make Addison break her only rule? Is the new player worth the shot or is she is risking her heart in a game she can't possibly win? Hellooo, lovelies!! I’ve got a steamy new release that is part of a hockey romance series by Jennie Marts!! Do I need to type anything after “hockey romance” to entice you to buy?! Really?? 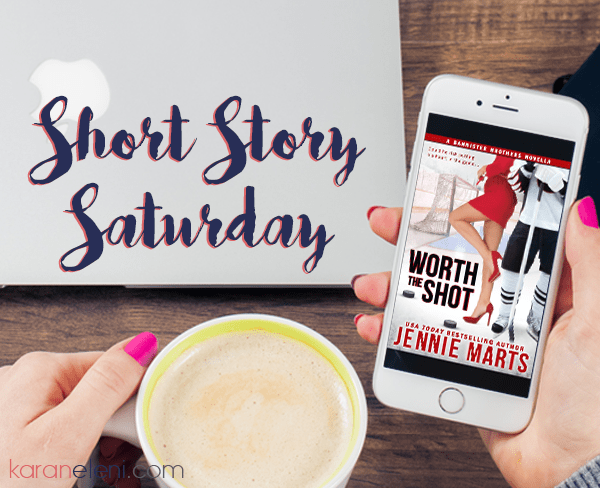 WORTH THE SHOT is the first of Jennie’s books that I’ve read and a super quick, super smokin’ read! If you need something to keep you warm during this oddly cold Spring weather, go grab WORTH THE SHOT right now. It’s worth the buy and I almost wish I would have read it Monday night during a snowstorm earlier this year! The next Bannister Brothers series book, Icing On The Date, is out now as well! So basically, meet two of the Bannister Brothers today! !